Another month has passed since my last update on progress constructing terminal 2 for my modern Chinese 1/400 scale airport model - Xin Long. 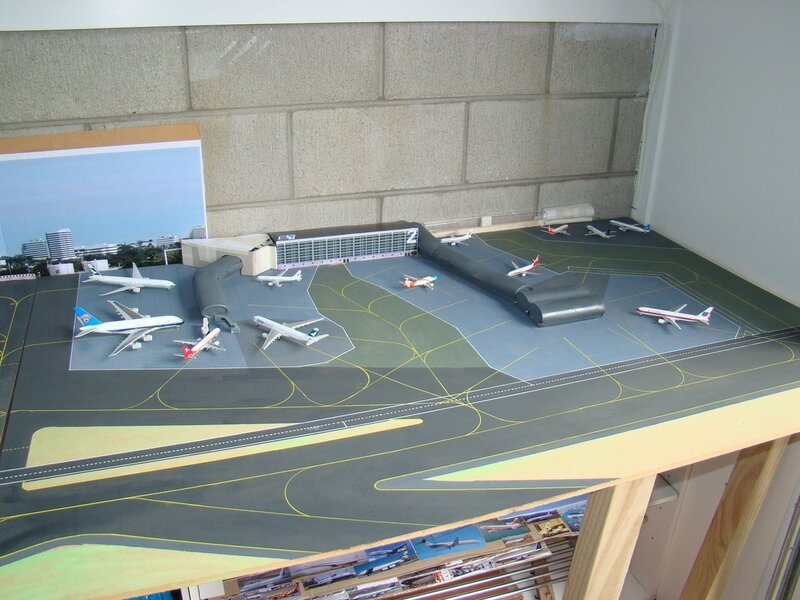 In the last update the apron painting was completed and the main terminal updated. In this part the gate layout is confirmed and work begins on the connectors between the piers and main terminal. "They are so easy to use. You just shake and then press the nib down until paint arrives. They can produce a thicker line with a harder press and even better can be used with a ruler. Plus the paint dries in a matter of minutes and there is no messy cleanup. Simply replace the nib and they are good for storage." Read more about my first dalliance with paint pens in this entry from way back in July 2015. As you can see below the L shaped pier has 13 gates on it. Mostly these fit A320/737NG sized aircraft (the 7 gates nearest the terminal on either side) however the 3 gates around the outer side of the dogleg will fit up to 757s. The gate, which will become gate 25, next to the United 767 with two lines on it, was originally going to fit a 767 however after I'd painted it I realised that the airbridge to the gate the 767 is in would not fit unless I moved the parking line. That's why it has two lines in the photo below - oops. So gate 25 will now also only fit up to a 757 leaving two gates for large widebodies (the 2 gates furthest from the terminal).